You can zoom in and out of this map and click & drag it to move around and explore it. Click on the different colored markers for more information on that particular civil war site. Timeline of Events in West Virginia during the Civil War along or near U.S. Route 219. June 3, 1861 – Battle of Philippi, also known as the “Philippi Races” was the first land battle of the entire Civil War. General George B. McClellan, recently appointed commander of the Army of the Ohio, began the Federal campaign in northwestern Virginia in late May to secure pro-Union counties, as well as the important Baltimore & Ohio (B&O) Railroad. On June 3, Union troops surprised a Confederate force at Philippi, which immediately began to retreat toward Huttonsville in Randolph County. The disorderly Confederate retreat earned the battle the nickname the “Philippi Races.” Philippi is approximately 27 miles northeast of Elkins on U.S. Route 250. July 7-11, 1861 – Battle at Laurel Hill (approx. 9 miles northeast of Elkins). After Philippi, Confederate troops under Brig. General Robert S. Garnett fortified a camp at the foot of Laurel Mountain. Union troops under General Thomas Morris advanced on the Laurel Mountain encampment on July 7, and skirmishes occurred over the following days. Garnett retreated early in the morning of July 12 after hearing news of the Rich Mountain defeat. Battle of Laurel Hill website. 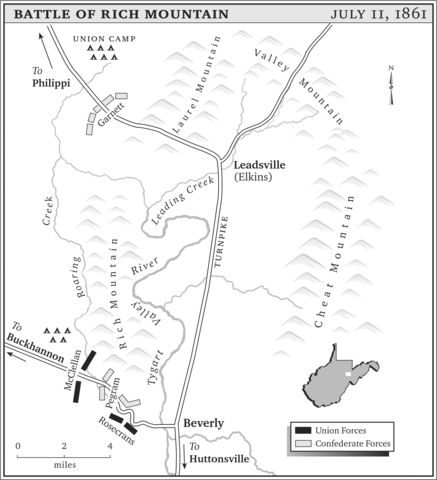 July 11, 1861 – Battle of Rich Mountain (5 miles west of Beverly). While Federal troops distracted Confederate attention at Laurel Hill, Union troops moved on the rebel camp on Rich Mountain. In a surprise attack, General William S. Rosecrans and about 2,000 men defeated about 1,200 Confederates commanded by Lt. Colonel John Pegram. After a couple hours of fighting, much of the Confederate force, including Lt. Col. Pegram, surrendered to Rosencrans. Pegram became the first former U.S. Army officer to be captured while in Confederate service. Word of the surrender reached the larger Confederate force at Laurel Hill (see above) and convinced its commander, General Garnett, to retreat toward northern Virginia. Rich Mountain Battlefield website. Map of Rich Mountain and Laurel Hills positions. From wvencyclopedia.org. July 13, 1861 – Battle of Corrick’s Ford. After the Confederate defeat at Rich Mountain and Laurel Hill, Confederate General Robert S. Garnett withdrew in retreat with 4,500 men back toward Confederate northern Virginia. At Corrick’s Ford on the Cheat River (near present day Parsons), he was overtaken by Federals under his West Point classmate, General T. A. Morris. Here Garnett’s army was defeated, and he was mortally wounded. Corrick’s Ford Battlefield website. September 12-15, 1861 – Battle of Cheat Mountain was the first battle in which Confederate General Robert E. Lee led troops into battle. After attempting to surround the Federal fort on the summit of Cheat Mountain, General Lee called off the attack and withdrew due to false information from prisoners and poor communications among the various Confederate commands. General Lee was camped at Valley Mountain, near Mingo Flats, around this time. Camp & Fortification on Cheat Mountain Summit, From a contemporary sketch made by a soldier artist of the 2nd West Virginia Infantry. Courtesy of the WV & Regional History Collection, WVU. September 13, 1861 – Col. John Augustine Washington is killed while out scouting enemy positions at Elkwater, near Huttonsville. Col. Washington was aide-de-camp to Confederate Gen. Robert E. Lee and was the great-grand nephew of George Washington and the final inheritor to the Mount Vernon estate. Historical marker and interpretive sign at Elkwater, along U.S. Route 219 near Huttonsville, in Randolph County. October 3, 1861 – Battle of Greenbrier River took place on the Greenbrier River near current day Bartow (22 miles east of Huttonsville on U.S. Rt. 250). Near here was Camp Bartow, fortified by Confederate troops in 1861. Union commander General Joseph J. Reynolds decided he could clear Confederate troops and take control of the Staunton-Parkersburg turnpike to eastern Virginia. At Greenbrier Bridge, an artillery duel was fought and the Federals were repulsed, returning back to their camp at Cheat Mountain. Map of the Battle of Greenbrier River, drawn by A.T. McRae, C.S.A. May 23, 1862 – Battle of Lewisburg. After taking up positions at Lewisburg, Union Colonel George Crook and his 1,600 were attacked by a Confederate force of 2,200 under General Henry Heth. Despite facing superior numbers, Crook and his men repelled the advance, killing 38, wounding 66, and reportedly capturing nearly 100 prisoners, while losing only 13 under his command. August 26-27, 1863 – Battle of White Sulphur Springs. Union General William Averell led a force of 1,300 mounted troops and cavalry on a raid targeting Lewisburg and the Virginia-Tennessee Central Railroad in late August. This force was met at White Sulphur Springs by 2,000 Confederate troops sent to block Averell’s raid and fighting commenced throughout the day on the 26th. After failing to break the Confederate positions, General Averell decided to withdraw on the 27th. Although Averell failed to meet his objectives, the Confederates failed to destroy or capture the outnumbered Yankees and Averell successfully withdrew. Junction of the Anthony’s Creek road and the James River and Kanawha Turnpike ‘now route 60’ where Averell’s force met Pattons brigade in a head on collision at the Battle of White Sulphur Springs. This was the scene of the fiercest fighting; the road in the center was filled with the dead and wounded. Courtesy of the WV & Regional History Collection, WVU. November 6, 1863 – Battle of Droop Mountain – One of the largest battles of the Civil War to occur in (what would become) West Virginia was fought in southern Pocahontas County on Droop Mountain. In November, Union General William Averell led another attempt from Beverly to attack the Virginia and Tennessee Railroad in southeastern Virginia and clear Confederate forces from the Greenbrier Valley. Confederate troops under General John Echols took up defensive positions along Droop Mountain on the morning of Nov. 6 and were engaged in battle by Union troops throughout the morning. By the afternoon, General Averell and his union force had overwhelmed the Confederate troops who began a full retreat to Lewisburg. Union troops followed slowly behind but the majority of the Confederates succeeded in withdrawing into the safety of southeastern Virginia. The Battle of Droop Mountain successfully cleared any significant Confederate military presence in the new state of West Virginia for the duration of the war, effectively securing its new boundaries. Droop Mountain Battlefield became the first state park in West Virginia. It was also the site of a Civilian Conservation Corps (CCC) camp in the 1930s, and many of the original CCC buildings can still be found throughout the park. Check out http://www.droopmountainbattlefield.com/ for more details. 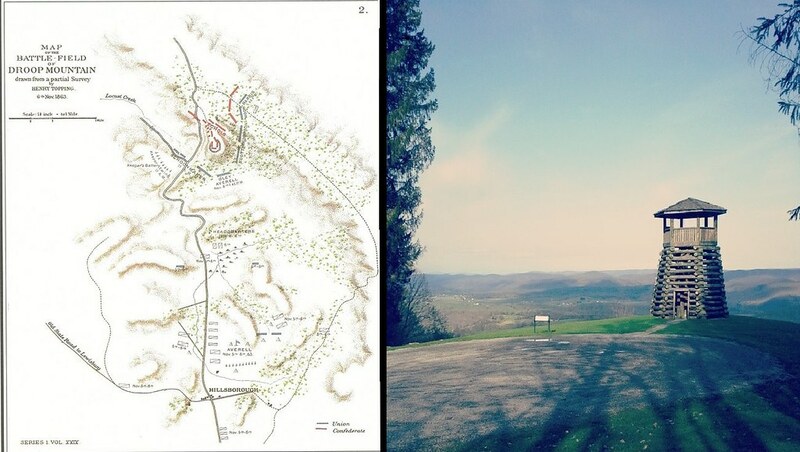 Original Civil War era map of the Battle of Droop Mountain, left, and the present day look-out tower from Droop Mountain Battlefield State Park, right.